wind_power, originally uploaded by Luke H.
Two words say it all. 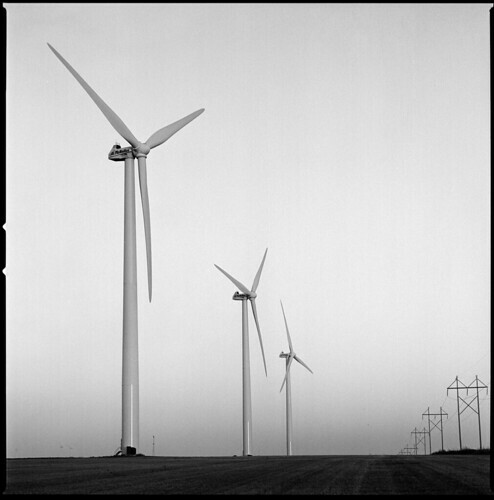 Yes, Minnesota is definitely becoming a powerhouse in the wind power generation field. With the Buffalo Ridge area in southwestern Minnesota, two wind farms that I can think of near my hometown of Austin and the company who has too much money to invest in wind power, McNeilus of Dodge Center, the sky is truly the limit. They are huge. If I remember correctly, the blades span nearly the length of a football field. who r u to determine how much money is too much for anyone to invest in the future of wind powered energy?? What do you propose as the $ cut-off for saving fossil fuels use?? "What? R U on crack??"